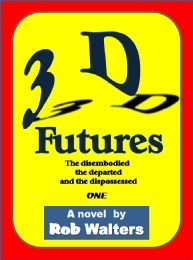 In 3D Futures humanity has trifurcated into the disembodied, the departed and the dispossessed, as the title explains. 3D Futures tells the interwoven story of each group, offering essentially three shorter stories in one novel. Mixed in with the three separate threads is a description of the events that led to the trifurcation. Some might not appreciate so much narration (though the chapters are generally not long), but I don’t mind such things. I find creative accounts of what may be in store for humanity to be intriguing. In this case, though, I didn’t entirely buy how things went down, but I might be overly critical due to my background in social science. Still, it served its purpose in laying a plausible enough justification for the remaining stories. Of the three groups – the disembodied, the departed and the dispossessed – I found the disembodied to be the most interesting. They were the ones wealthy enough to afford the high price to upload their consciousness into a digital world. Their day-to-day existence is different enough from normal human existence to be almost alien. I found exploration of their social structure fascinating, and the plot line for this group was an engaging mystery in its own right. The departed left Earth on a colony ship. Funded by the Chinese Economic Entity, the massive ship is itself divided socially between the crew who operate it and the those who bought or were awarded stakes to ply their trade and ensure a functioning society. But life on the ship is not all that it initially seems, and when a young boy stumbles upon a hidden truth, it sparks a revolution. Although it began a bit slow for me, the departed plot eventually gained momentum and tackled some serious social issues. The final group – the dispossessed – are the remaining inhabitants of Earth who neither departed nor disembodied. They live in a post-collapse world – sparked by a brain and wealth drain from the disembodied – where humans have become much more savage. As I said before, I don’t entirely buy the logic of the collapse that led to this state, but that doesn’t take away from an otherwise good survival story if you like that sort of thing. All three stories eventually intersect, at least tangentially, and offer a glimmer of hope for humanity’s future. There were some occasional errors that would have benefited from additional proofreading, and perhaps it could have been edited down a bit in size. But overall 3D Futures is certainly good value for the $0.99 price and one worth checking out.